How to start a fix and flip real estate business? 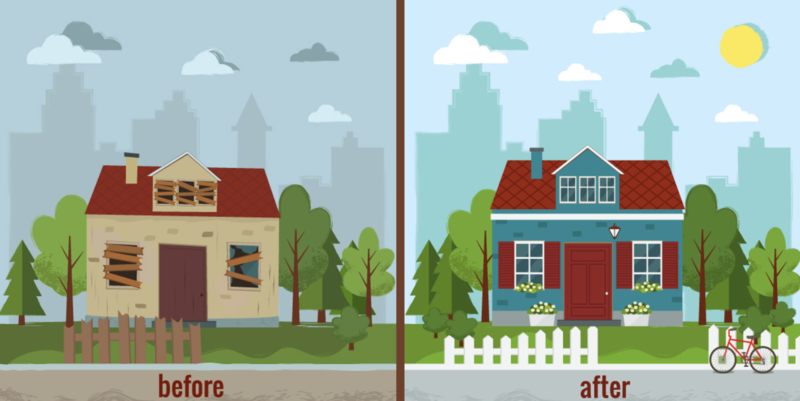 When most people think of real estate flipping they think of the classic fixer-upper home. You know something that just needs paint and carpet and then can be sold for a $30,000 profit. Those exist here and there, of course, but there are a lot of investors looking for them. If you want to avoid the competition, there are other types of real estate that can be turned for a profit. Here are three examples. The first profit I ever made in real estate was a piece of land. It was less than three acres and I bought it, cleaned it up and sold it for 30% more just two weeks later. The key to doing this is not in buying the land far below the market value (although that would help). Instead try to add value or perceived value in some way (I cleaned the brush and outlined a driveway using a shovel and rake). In addition, you can always add value by selling it on easy terms. Sometimes a property is just not being used the best way for the area it is in. A house in a business district, for example, might be made into offices and sold for more. A piece of land with an old mobile home may be worth more with the mobile home removed. Look for opportunities to change a piece of real estate to a higher use. Maybe you’ve been watching those shows that tell you how to flip that house, but you don’t have the tens of thousands of dollars they seem to inevitably spend in the process. Want some fast and cheap fixes to increase the appeal and selling price of a house? Try some of the six that follow. It tough to get a great price for a home with major flaws, but buyers will excuse minor ones if they have already fallen in love with the house before they notice these little problems. In other words, make a good first impression on them. The mailbox is the first thing they’ll likely see, so install a new one with a few flowers around the base. It will cost you less than fifty dollars to do this. Landscaping changes are another fast and cheap way to a great first impression. Clean the front yard, mow the lawn, trim the trees, throw some grass seed on any bare spots if you have time, and plant a few flowers here and there. Make it neat, clean and green. You’ll be surprised how far a hundred dollars can go if you do this part yourself. An empty house never feels or looks quite right. It’s true that some people can easily imagine what their furniture will look like in those rooms, but not all of us have such visualization skills, so make it easy on those buyers by having some tables, couches, chairs, and even a few paintings hung here and there. To really keep this part cheap, see what nice things you have at home, and borrow them for a while! It’s embarrassing to stand there with a buyer explaining why the toilet doesn’t flush, and its little things like that which can scare off a buyer. Get or make a list of things you would check if you were buying a home, and go through your house with it, testing everything. Look at every room as objectively as possible, or have a good friend do this for you as though he was interested in the home as a buyer. Many changes are debatable, even if some repairs are required. Replace the perfectly good but somewhat ugly carpeting or not? Wallpaper or paint the rooms? Maybe! Consider the over-all look of the house if you make a set of changes, and estimate how much they will add to the final sale’s price. Aim for changes that add double or more what they cost you. There may be opportunities for improvements with much higher returns than this. An investor friend of mine spent about $1,500 once, to increase a home’s value by about $8,000 or so. The house had a basement with big windows, so he just added two walls in a corner, along with a cheap paint job and a piece of carpeting to create a third bedroom. To flip that house for big profits with little investment in time and money, get creative and look hard for opportunities like that. A company that’ve been using with no charges to promote my deals is properties Miami they’ve been able to help me without no cost. Leave a comment on How to start a fix and flip real estate business?